We recently released an major upgrade to our Employer Reports and in this article we will the basics of how they work. Every chart and table on your reporting dashboards has a short description of data being provided in the chart, as well as, the filters that can be applied to it. Filter values can be applied in the Filter bar. Depending on your role within your organization you will have access to different sets of filters on your reporting dashboards. Clicking "Jose Rivera" from the Teammates filter and then "Apply" (or double-clicking "Jose Rivera") will filter the charts on the dashboard to only display data specific to Jose's JobCasts. As you can see in the image below the filter bar now displays that the "Jose Rivera" filter is active, even when the bar is closed. To select multiple filters at once, simply select values from multiple filters. To see data from Jose's JobCasts that started in the last 90 days, check both "Jose Rivera" from the Teammates filter and "90 days" from the Date Range filter and click Apply. Several options can be accessed from the dashboard level by clicking on the burger menu in the upper right-hand corner of each chart. You can search for values in Tables by clicking on the magnifying glass icon and typing in values into the search bar that appears at the top of the chart. The underlying dataset of any chart can be downloaded as a CSV file by selecting "Download CSV." Available only for charts in the table format, "Edit Pivot" allows you to access a table's pivot functionality. 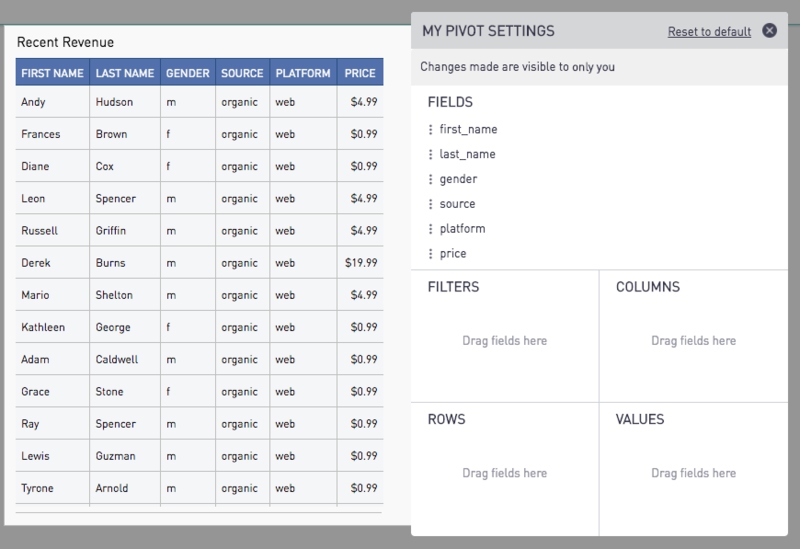 For more information, check out the documentation on how to set up and create settings for pivot tables.